This is going to be a great show. I’m interviewing one of the comic creators and crowdfunders I look up to and have learned a ton from over the years. We’ll be talking all about building an audience. This past week has been busy. I had a ComixLauch Live session as practice for the workshop. However, I ended up throwing 3/4 out the window. We have a new series on the shelves this week: CHUM #1 from Ryan K Lindsay, Sami Kivela, Mark Dale published by ComixTribe… Surf Noir – Pulp Fiction on the beach. Track it down at your local comic shop, grab it at shop.comixitribe.com or get it digitally on Comixology. We also launched another Kickstarter, MummysAlwaysRight.com, with Joe Mulvey. I’ll have Joe on the show to talk about the transition from Comics to children’s books, and how a daily sketch he drew for his daughters turned into his new book. Finally, we’re creeping up on the 50th episode of ComixLaunch! It’s hard to believe it… I’ve been working on something super special for this milestone episode. It’s going to be a lot of fun and I can’t wait to share with you guys. I’d love to get to 50 reviews on iTunes in time for Episode 50? I’d love it if you can help us do that! My guest today is the artist and writer of ReMind and Sithrah, Author of Unnatural Talent Creating, Printing and Selling Your Comic in the Digital Age. Formerly worked for Dreamwork animation, but left in 2015 to pursues self-publishing. Welcome to ComixLaunch, Mr. Jason Brubaker! 1) You launched your latest Kickstarter for Sithrah volume 2 with a $24K goal. Definitely not chump change. Yet, you were fully funded with the support of 500+ backers in 24 hours. I’m positive, my listenerers are wondering… how exactly does that happen? 2) Building an audience… I know there are a lot of people who listen to this show, and they’re thinking… “Okay, build an audience. Build an audience. I know I need to build an audience!… but how?” Knowing what you know now, if you were able to go back and time and drop some knowledge on young Jason B. with the goal to help him build an loyal audience… only faster, cheaper, and with less speed bumps along the way… what advice would you give him. 3) And what advice would you give to the creator who’s maybe been at this for a while now, not a newbie, been creating… and is in a bit of a rut. Maybe webcomic’s page views are flat, or can’t seem to grow fanbase. What tips or strategies might you have for him or her? 4) Now, you’ve launched 5 Kickstarter projects, and raised over $200K on the KS platform… but you did launch a project for an audio recording of your book Unnatural Talent: Creating, Printing, and Selling Your Comic in the Digital Age. One of the biggest keys to building trust with an audience is being open and honest and sharing successes and “failures” with them… what did you learn from that unsuccessful campaign? I’ve said before that a failing to fund shouldn’t be looked at as a failure… but rather simply a test. Agree? 5) Every time I launch a campaign, I’m always trying a few new things… are there anything new strategies you’re experimenting with on the Sithrah V 2 campaign? 3) One of the things I’ve noticed is that Creators on Patreon tend to launch far more lowkey than creators on Kickstarter… with Kickstarter, we know launching hot out of the gate is important so you’re not buried in the KS algorhithm and that the countdown clock starts ticking immediately, whereas there is no time pressure for Patreon. Still, I think it’s a mistake not to also treat your new Patreon “launch” or an event. Thoughts? Any tips for launching a Patreon page? 4) How much extra time do you put into managing your Patreon page, posting, rewards, etc.? What do you do to keep existing Patrons engaged, and encourage new patrons, while at the same time staying on track with your production? 5) If a creator is on the fence about choosing whether to launch a Kickstarter or a Patreon, what advice would you give them? Do they even have to choose? Should they do one before the other? 6) If you could change anything about the Patreon platform to make it better, what would you change? Today’s ComixLauncher — Write down one idea from this podcast you will implement to help grow your audience. 1) What’s next for you and Coffee Table Comics after Sithrah volume 2? Any other projects you’re working on that you’re excited about? 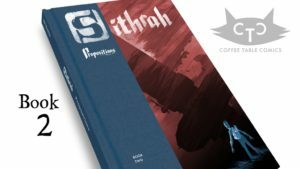 2) Besides checking out Sithrah over at Kickstarter, what’s the best way for listeners to connect with you? down his 5 best tactics for closing with a bang, with examples pulled from his latest and greatest Kickstarter launch. If you’re running a Kickstarter campaign right now, you can’t afford NOT to listen to this one. Happy Belated Mother’s Day to all the Mother’s out there! She raised $11,430 on a $9,850 goal, powered by 220 backers; bringing her first Graphic Novel Collecting Gamer Girl & Vixen to life. Story Mode! (Not choose your own adventure!) in the updates. It wasn’t easy (we never say it’s going to be easy) But I think it was easier, especially because she had 10 other creators in her corner throughout the campaign giving her feedback on updates. Deconstructing her email blasts to her list. Suggesting small tweaks mid-campaign that could have a big impact. In fact, there was a strategy that I employed in the C is for Cthulhu campaign that worked extremely well… I shared it with her, she tweaked it slightly with her on take on it, executed it, and boom, $1000 boost in the middle of her campaign, in the dead zone that is always the toughest part. Set the bar high for our other Members — Chris Garrett – Defects Vol. 1, Josh Janes Lost Dogs MC, and Cody Stewart’s – The Slip… all coming up. They look great. I will definitely have Kristi on the show at some point to share her lessons learned. Recently finished the C is for Cthulhu Coloring Book Campaign. It ended up, by $5, being the most funded campaign I’ve managed. And while it got off to a strong start, with the most backers I’d received in the opening 24 hours, it was by far, the strongest finish of any campaign I’ve ever done. In fact, the last two days of the campaign were, by far, the best two days of the campaign in terms of funding. 163 New Backers or 16% of the total backers for the campaign. $13,221 in funding or 31% of the total funds raised in the campaign. Not bad for just 2 days, right? Now, strong finishes are common, it’s Kickstarter math, so these results aren’t necessarily outliers. However, they also don’t necessarily just happen. There are plenty of projects that end with a far more mild bump than what we were able to achieve. In this episode, I’m going to give you 5 Tips for having an explosive end to your campaign. Things speed up in the final two days… Relativity at play here. Having an end of campaign game-plan in place before the final 48 is huge!!! Checklists are a way to save yourself from missing steps. During a long exhausting campaign it’s easy to forget stuff. Checklists, created in advance help us. One of the most valuable things inside TcC is the detailed checklists. Turn off your paid advertising! First, perfectly okay not to have stretch goals. Not a must, and the newer you are to crowdfunding, the more recommended it is to keep things simple. Is making that book and campaign better for your backers being greedy? Is wanting more people to get your book in their hands being greedy? Is building more profit into your campaign being greedy? I don’t think so… Reality is most creators won’t do a KS this year. Those that do will only do one… And it will be the biggest income month of the year… Followed by several down months while fulfillment takes time and energy. When you’re campaigning, you owe it to your future self to give it your all… And if that means stretch goals and overfunding, there shouldn’t be any guilt associated with that. 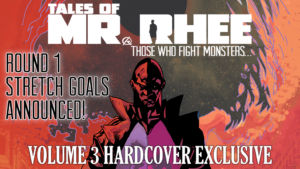 Now, the tip is to design your stretch goals such that there is always one or two within reach that you can stretch to and rally around in your final 48 hours. So, for Cthulhu, 3 days out, we were at $27,197… heading into Final 48 hours. Because I was confident my $30K stretch goal would inspire a rush of new pledges and pledge upgrades, I was pretty confident $40K was attainable, too. But $50K… wasn’t going to happen. Decided to slip in a new stretch goal, $42,484… at which we would reveal the next title by Greg and Jason. Why that amount? It was $1 higher than our previous funding target. Well… what happened? With about 3 hours before close, we were about $1,200 away from that amount. With 15 minutes to go… we were less than 200. And with less than 5 minutes to go, we hit it… and ended the campaign just $5 over that mark. Coincidence? Or did having that final stretch goal make the difference? It definitely helps if your Stretch Goal can be extra awesome… and ours was… a Giant C is for Cthulhu Plush doll. Not always possible or desirable to have a big game changing stretch goal at the end of the campaign, but believe me… it’s effective. 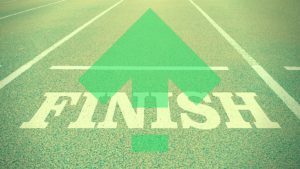 Here’s what I don’t want you to be doing in your final 48 hours… rushing to FB or Twitter 10 times on your final day day, crafting updates, making images and posting them to post reminders that your campaign is ending. You’ve got more important things to do… such as monitoring the Kickstarter, fielding last minute questions, and celebrating a job well done. To avoid this, block out an hour or so at some point during the final 48 hours, and batch your Kickstarter and Twitter updates. Frequency – Twitter – final day, final 12 hours, hourly countdown, 45, 15, 10, 5, Thank You. Facebook – Final Day, final 12, final 9, 6, 3, 2, 1, 15, done. Facebook – Schedule posts, starting from Campaign end and work backwards. No more than one a day… accept the last day. Stretch Goals Unlocked – Let them know. You need to email your list. Now… a little cheeky… but there’s a lot of truth to it. When you have an email list and you have a product to sell or a campaign to fund, there is a direct correlation between emails and sales. Fee-Fi-Fo-Fum… GIANT Cthulhu Plush is available for 15 hours only! Now, one of my bonus tips that turbo-charges the urgency of those final emails to your list is the inclusion of a CountDown Timer right in my email. In just a few seconds, you can set up a great looking animated countdown timer that countdown the seconds right in your email. This adds urgency, it increase clarity and attention… and gets extra clicks. Go ComixLaunch.com/workflowy and check out that app! My guest today is a film director and writer of comics and children’s books. You know his impressive body of work for Marvel Comics, writing books like X-Men, Iron Man, Incredible Hercules, and the Incredible Hulk, among many others. He also recently finished up a long run on Batman/Superman for DC Comics. In addition to his Big-Two work, my guest is also an incredibly successful crowdfunder, having Kickstarted comics and children’s books. 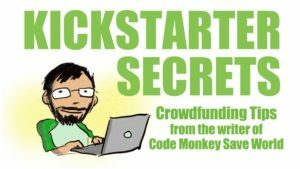 His graphic novel “Code Monkey Save World” based on the songs of Jonathan Coulton and drawn by Takeshi Miyazawa was the 9th most funded comic Kickstarter of all time. His latest project is “Kickstarter Secrets” a book of practical crowdfunding tips, is on Kickstarter right now and is more than 200% funded with 3 weeks to go. Welcome to ComixLaunch, Mr. Greg Pak. Anything I missed from that intro? Well, one thing I missed, about a decade ago, you did a signing in a small Boston area comic shop, it was a sweet Hulk Doodle in my Planet Hulk Trade. Thanks for that. And I also want to thank you, for, about four years ago, shortly before ComixTribe released SCAM #1 from Joe Mulvey, you were kind enough to read the book, and you gave us some very constructive notes on the book, which we were able to to take some action on, and make some changes before making our direct market Diamond debut. So again, much appreciated. You have a new book called Kickstarter Secrets on Kickstarter right now, and this is a podcast all about the mindset, strategies and tactics that creators use to crowdfund their comics and graphic novels on KS. So it was a no-brainer for me to reach out to you and invite you on the show, and I’m glad you’re here. 1) We have an audience full of creators interested in harnessing the power of the Kickstarter platform to fund their projects and build their careers… can we throw some red meat at them immediately and reveal one “Kickstarter Secret” that you’ve discovered and talk about in your book? 2) I want to talk more about the book, but first I’d like to discuss the topic of who Kickstarter is for. Now, I know there are some listeners who are of the mindset that, they’ll use Kickstarter to help them make books, so they can get in the door eventually as big publishers. That Kickstarter is the stepping stone. But that’s certainly not the case for someone like you, or Sean Gordon Murphy, or Gail Simone, and many others. Who do you think Kickstarter is for? 4) So, Kickstarting a book on how to Kickstarter books… that’s pretty meta. What was the thinking around this campaign? 5) Let’s talk about the structure of the book itself. How is it organized? 6) I’m currently in the midst of my 8th Kickstarter campaign as well, and while I can say it does get easier over time… I’ve still yet to run “the perfect campaign.” What are some area’s of crowdfunding that you still find challenging? Whatever you can make it. 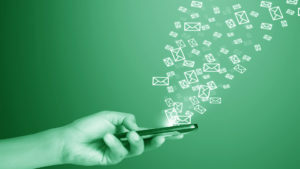 Make it so that if you’ve run several campaigns you can compile your mailing lists. And also so you can unsubscribe people. A formatting template in Microsoft word. Search Greg Pak comics template. Printing out scripts and editing by hand. Price out your shipping and be aware USPS prices go up in January. Today’s ComixLauncher — Go get Greg’s Book! 1) As difficult as it is to “break into” comics, staying in comics is harder… tips for staying in once you’ve broken in? 2) What’s are you excited about comics wise that’s coming up in the near future? Besides Kickstarter Secrets, which is on KS right now, what’s the best way to keep up with all things Mr. Pak?